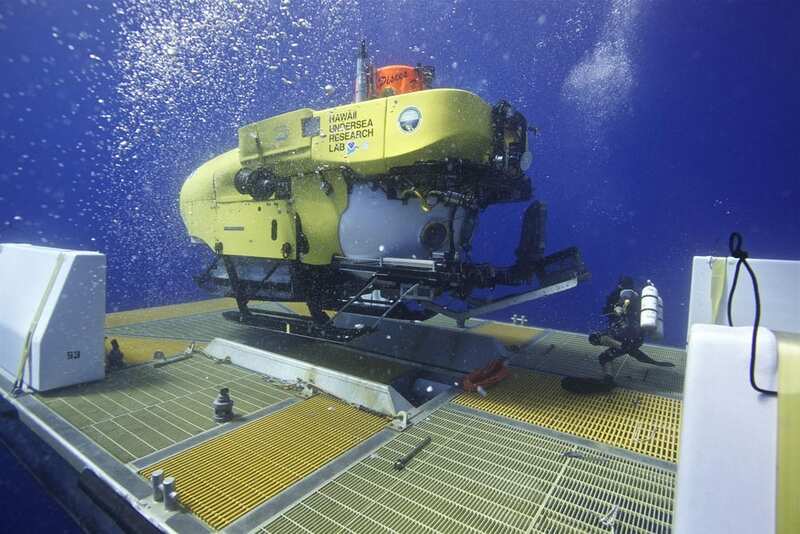 The laboratory, part of the University of Hawaii and better known as HURL, has been the sole submersible-based United States deep-sea research outpost in the mid-Pacific since the 1980s. At its helm is Terry Kerby, perhaps the most experienced submersible pilot alive. With a crew of five, Mr. Kerby and the Pisces subs have discovered more than 140 wrecks and artifacts, recovered tens of millions of dollars in lost scientific equipment, and surveyed atolls and seamounts whose hydrothermal vents and volcanoes were unknown. Pisces V came with no instruction manual, but Mr. Kerby found it was highly maneuverable and could hover motionless, even in strong currents. It also operated untethered from a mother ship, allowing exploration of caves and overhangs. Coupling Pisces with the University of Hawaii’s research ship, the Ka`imikai-O-Kanaloa, and a home-built submersible platform enabled Mr. Kerby to carry out missions from 60 feet down, during surface conditions too rough for any other submersible. Mr. Kerby racked up discoveries, beginning with exploration of the Loihi seamount off Kona. Eighteen years of return missions have revealed that an area once thought dead is a vibrant world of myriad ecosystems and volcanism still shaping the Hawaiian Islands. Along Loihi and other slopes, the team discovered living corals that predate even California’s bristlecone pines. April 18, 2019 - An explorer took a $48 million submarine on 3 record-breaking dives to the deepest corners of the ocean — and discovered a mysterious new species Business InsiderExplorer Victor Vescovo is attempting to reach the deepest points of the world's five oceans. April 13, 2019 - Why legendary hedge-fund founder Ray Dalio is choosing to explore the sea instead of space like other billionaires Business InsiderBridgewater Associates founder Ray Dalio is more interested in ocean exploration than deep space. April 14, 2019 - Seychelles chief calls from the deep for ocean protection Phys.OrgSeychelles President Danny Faure dived deep into the Indian Ocean Sunday to call for protection of "the beating blue heart of our planet." April 15, 2019 - Ask a Scientist: Most of the oceans are still unknown to us Press & Sun-BulletinResearchers and explorers still have most of the oceans to discover, including new species and vital ecosystems. April 15, 2019 - Odyssey Marine Exploration Expanding Mineral Asset Portfolio NasdaqTAMPA, Fla., April 15, 2019-- Odyssey Marine Exploration, Inc., a pioneer in the field of deep-ocean exploration, entered into a share purchase.